Taking a nod from AVG's free antivirus program, PC Tools has also come up with their free antivirus and whether or not it was created to help promote their paid solutions, we think it is a pretty stable antivirus program with protection against many known common threats. PC Tools' Free Antivirus offers basic protection again everyday threats common on the web. It is regularly updated and also offers protection against phishing, provides web site ratings and continues to also function as an anti-spyware and anti-malware application. As you might have noticed while installing the free version, it doesn't necessarily provide the best protection against zero-day threats, firewall protection, a mechanism to prevent identify theft among other features only available with the premium version. Version 9.1.0.2898 is a freeware program which does not have restrictions and it's free so it doesn't cost anything. 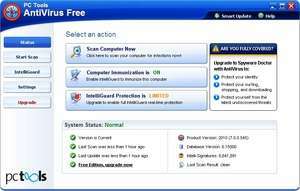 For security reasons, you should also check out the PC Tools AntiVirus Free download at LO4D.com which includes virus and malware tests. Additional screenshots of this application download may be available, too. PC Tools AntiVirus Free has a presence on social networks.